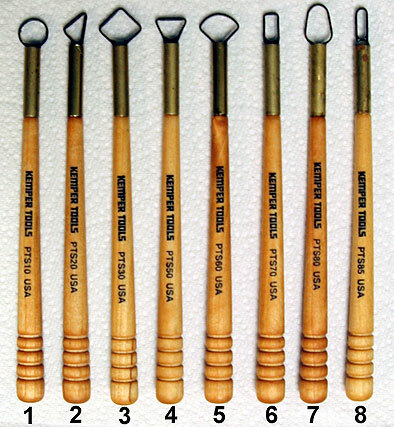 Kemper PRO-LINE tools are crafted from select hardwood handles. The steel loops and blades are made from "knife quality" high carbon steel that has been heat treated and quenched in oil to give the blades maximum hardness and durability. 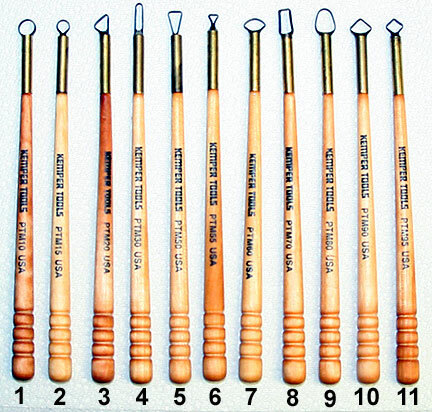 Because high carbon steel takes and holds a sharper and longer lasting edge than stainless, these tools last much longer even when used with highly groged clays and plaster. Since the cutting loops are made from high carbon steel which can rust, we recommend that the tools be kept clean and dry when not in use. Periodically applying a light coat of oil to the both the blade and handle will prolong the life of the tools. PT315- Birdbeak 2" x 1⅜"
PT360- Angled 1.8" x 0.9"
PT420- ½" HR x 1½"
PT430- 1" Sq @ 45 Deg. PT440- Triangle 1" x 1"
PT445- Triangle ½" x 1⅛"
PT570- Birdbeak 2" x 1⅜"
PT571- Birdbeak 1½" x 1"
PT572- Birdbeak 1" x 11/16"